species health measures. This data will be used to monitor the long-term efficacy of the retrofit. Sandy River Basin Watershed Council Director Steve Wise describing the retrofit plan during groundbreaking. The retrofit projects are at different sites throughout the MHCC campus. 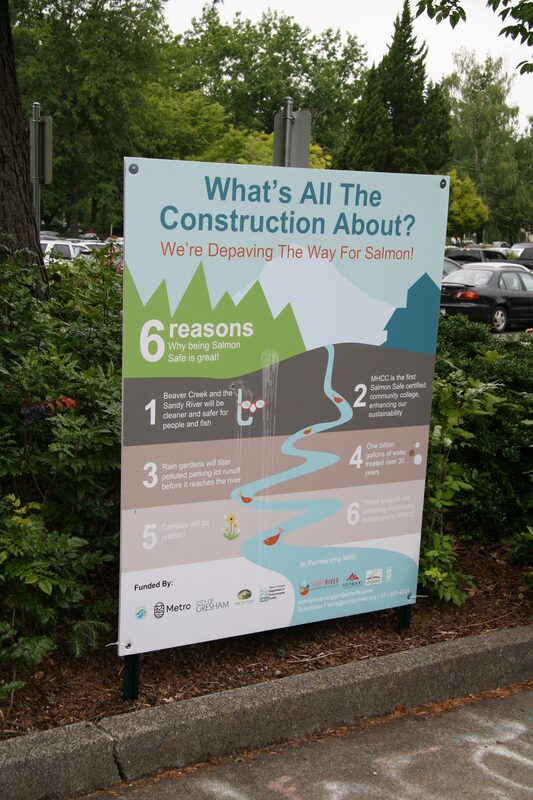 Educational signs on MHCC campus explaining the retrofit and environmental benefits. 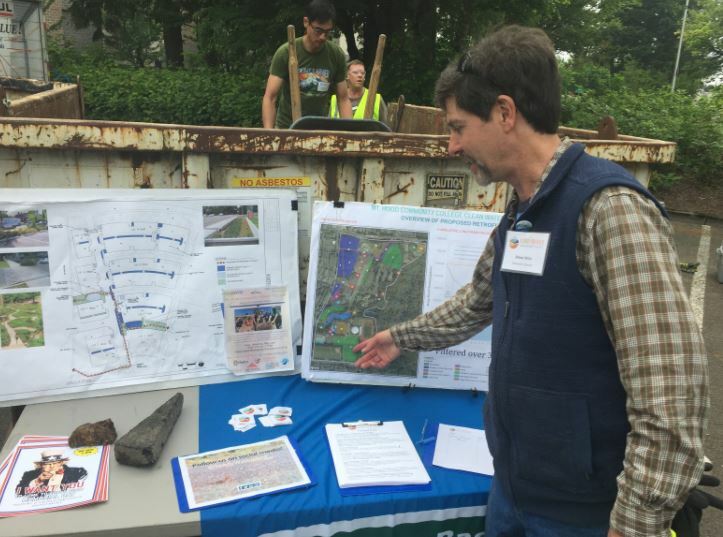 The Sandy River Basin Watershed Council is leading this project. SRBWC is also coordinating with Mt. 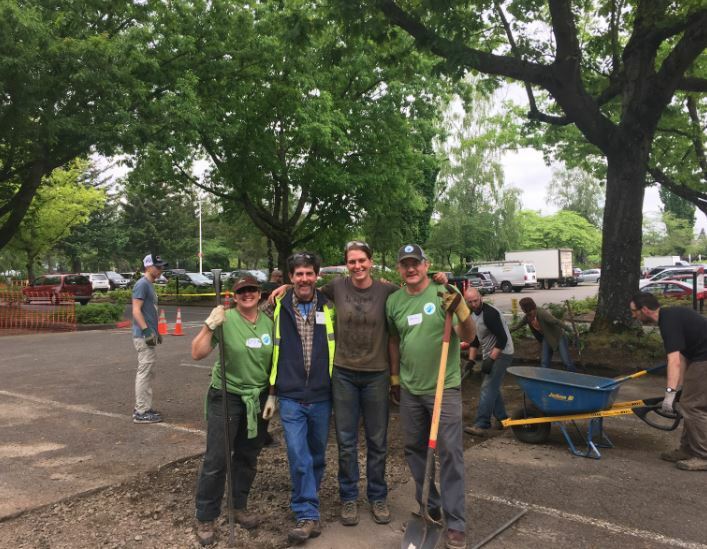 Hood Community College, a nonprofit called Depave that focuses on removing pavement in urban areas to create green space, the City of Gresham, and Portland State University. The project is funded by several external grants that SRBWC and MHCC received. MHCC has excellent staff and great potential for pursuing resilience projects; for example the college already had a long-standing partnership with SRBWC. However, the college noted that they would often be forced to “cut corners” in executing projects due to lack of capacity. By funding an intern position, MHCC and SRBWC will be able to collect better quality data, establish a baseline for the retrofit, and document efficacy of the project. This makes the campus better poised to advocate for continuation and expansion of the retrofit, as well as serve as a case study for other areas looking to do similar projects. The key role of the SRBWC intern is to establish indicators for ecological health that can be used to measure efficacy of the retrofit. This includes establishing baseline data for water, vegetative, and species health indicators on campus and in the watershed. SRBWC and MHCC will then collect indicator data over time to determine the impact of the project and track how ecological health improves. SRBWC Director Steve Wise and CRUX Coordinator Thea Kindschuh with Depave volunteers breaking ground on one of the retrofit sites.